The Susquehanna Waldorf School has, as part of their mission statement, “cultivate a love of learning, imagination, reverence, & compassion for others by educating the whole child– head, heart, & hands.” What a beautiful phrase… head, heart, & hands. It aligns with the physical, spiritual, & mental aspects of our whole person. In one word… BALANCE. Don’t we need that for healthy, inspired living? If I am physically exhausted, I do things involving my mind or my heart such as reading or creating art. If I’m mentally worn out, I balance that with activities that are more physical or spiritual in nature. When my heart is aching, I go for a walk in nature with my dogs & boyfriend or challenge myself mentally. I’m at a point in life where I can sense imbalance & try to right it. Too much focus on head, heart, or hands can be alleviated by switching focus onto one of the other two. The wonderful thing about creating art is that it is an activity that combines all three when done well. 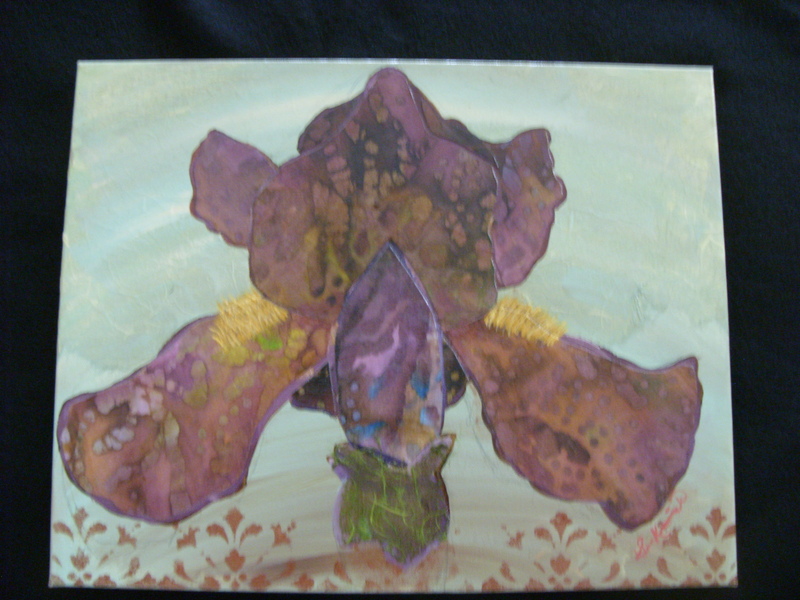 Look at Antique Iris shown below. My head made the decisions regarding composition & symmetry. My hands constructed the piece out of handmade paper, batik fabric, & paint. My heart chose the subject, the colors, & the mood of the piece. My art balances me. What do you do to regain balance? Antique Iris- Head, heart, & hands combined to make this piece. A symbol of balance. This entry was posted in A Window on Life, Art and Soul, My Love for Nature and tagged art, balance, collage, garden, hands, head, heart, inspiration, Iris, nature, Waldorf by puresusan. Bookmark the permalink.